Although the notion of a three-cent piece strikes us as strange today, in 1851 the denomination actually seemed like a good idea to members of Congress and even to members of the public. It did serve a purpose for a time. The impetus for this coin—the smallest ever issued by Uncle Sam in terms of weight and thickness—was twofold. It was “fathered,” so to speak, by the California Gold Rush and “mothered” by the nation’s postal system. By 1851, hardly any silver coins remained in circulation, creating a real problem for merchants and their customers. The only coins available for making change in amounts less than a dollar were copper large cents and half cents, which most people found extremely inconvenient; there wasn’t even a “nickel” as we know it today, since the five-cent coin in use at the time was the silver half dime and was among the hoarded pieces. As luck would have it, federal officials were then in the midst of reducing the basic prepaid postal rate from five cents to three cents. Senator Daniel Stevens Dickinson of New York concluded, logically enough, that a three-cent coin would be a useful way to purchase stamps. At that time, most Americans were uncomfortable with the notion of fiat money (money worth substantially less intrinsically than its face value), so they surely would have rejected a base-metal three-cent piece with only, say, a cent’s worth of copper. On the other hand, a precious-metal coin made from the alloy then being used in existing silver coins (90% silver and 10% copper) might have been subject to the same kind of hoarding and melting. Dickinson and his allies hit upon a compromise: a three-cent coin with enough precious metal to avoid being thought of as fiat money but not enough to draw the interest of hoarders. The alloy they selected was 75% silver and 25% copper. This proposal became law as the Act of March 3, 1851, taking effect June 30 of that year. In 1853, Congress passed legislation reducing the weight (and thus the silver content) of the half dollar, quarter, dime and half dime. This had the desired effect of discouraging further hoarding and re-establishing all these silver coins in circulation. That same year, it authorized an increase in the fineness of the three-cent piece up to 90%, bringing it in line with the other silver coins. A simultaneous one-twentieth-of-a-gram cutback in its weight kept it below the point where melting would be profitable. These “Type 2” three-cent pieces didn’t appear until 1854, after Longacre modified the original design, making it easier to detect the new issues. Among other things, they have two extra outer rims around the star for a total of three. In 1859, further tinkering occurred to correct striking problems, and from then through the end of the series in 1873 the “Type 3” issue had only two rims around the star. Because the Type 1 “trime” comes in only four date-and-mint varieties, it could easily be collected in that fashion. Many prefer to set aside just one high-grade example, however, as part of a type set also including one example apiece of the other two types in this series. Although their initial popularity quickly waned, most of the early trimes saw extensive use in circulation. 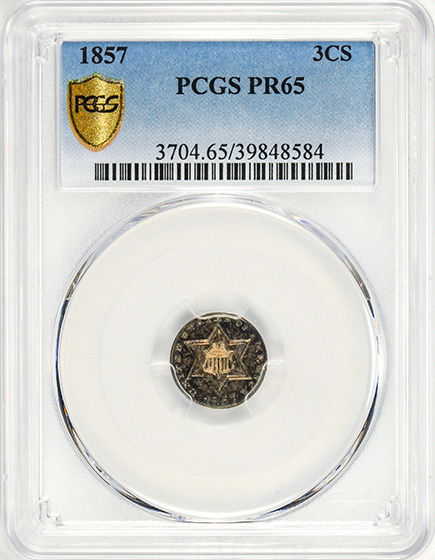 As a result, high-grade mint state specimens are extremely scarce, especially in levels of MS-66 and above. Places to check for wear include the points of the star and the high parts of the Roman numeral III. Weak striking is common with this issue and should not be mistaken for wear. As it would throughout history, once again gold ruled events. It was gold that brought men west in 1849, gold that created havoc with circulating coinage and ultimately gold that was responsible for one of the Mint’s most unusual products, the tiny silver three-cent piece. The late 1850s was an era when Spanish one-half, one-, two-, four- and eight-reales circulated right alongside United States issues. By the end of the decade, however, discoveries of gold fields in California and Australia drove down the world market price of the metal to a point where gold became cheaper in terms of silver, eventually causing the bullion value of many silver coins to exceed their face value. With the increase in silver’s price, vast quantities of coins were melted for export to Europe. By 1850, silver coins were disappearing everywhere. Stores, hotels and railroads began to pay premiums for coins. Commercial life was chaotic. The U.S. public and commercial establishments tried to adapt to the rising silver price. Since the degree of wear determined the weight of silver in a coin, the public evaluated their coins, spending the worn ones and hoarding high grade ones. Banks and post offices discounted the Spanish coins by allowing only 23 cents for a two-reales piece (nominally 25 cents), 10c for one real (12 ½ cents) and 5 cents for a half real or medio (6 ¼ cents). The U.S. Government, however, ignored the fact that the coins were worn and paid the full value to keep commerce as stable as possible. On January 9, 1849 the Chairman of the Committee of Ways and Means, Samuel F. Vinton, wrote a letter to Mint Director Robert M. Patterson requesting proposals for a new cent of reduced size and a three-cent piece “to be made of copper and some other precious metal.” A year later, Senator Daniel Dickinson, the head of a committee preparing a bill to reduce postal rates, introduced a bill proposing these two coins as a way of buying the new postage stamps and making change. The proposed coins consisted of a cent composed of .100 fine silver and three-cent coin of .750 silver. Congress did nothing with this proposal until 1851. In that year, it passed the postal rate bill reducing the cost of mailing a letter from five cents to three cents. Since the copper coins in circulation were not legal tender and “shinplasters” (private bank notes and merchants’ scrip) weren’t acceptable as payment for postage, how would the public pay for the stamps? Though the reduced size cent wasn’t approved, the Dickinson three-cent coin was reconsidered and finally authorized by the act of March 3, 1851. It was to weigh 12-3/8 grains and be .750 silver and .250 copper. Since the face value exceeded the bullion value, the coin was sure to stay in circulation. 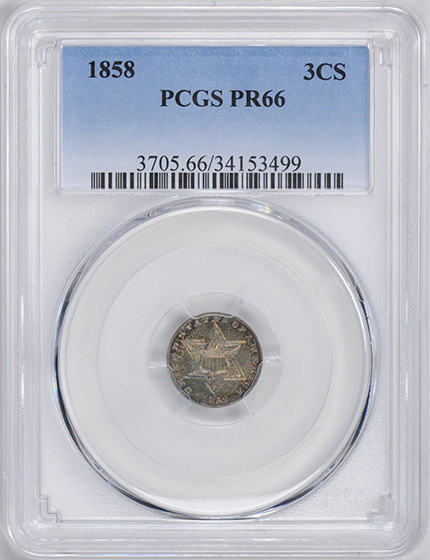 This first three-cent piece, known as Type 1, was designed by Chief Engraver James B. Longacre. The design consists of a six-pointed star at the center, upon which is the Union shield. The inscription UNITED STATES OF AMERICA and the date are around the border. The reverse depicts thirteen stars surrounding a C-shaped device within which is a Roman numeral III. Congress hoped that this coin would help sell postage stamps and alleviate the coin shortage. Although critics called the coin “debased,” the public initially loved it. The government loved it also, since a dollar’s worth of three-cent pieces was worth only 86 cents in gold. The need for small change was so great that people were impatient for the coin’s release. To avoid a panic, more than 100,000 pieces were manufactured before the mint began to release them. In less than two years, there were 20 million more in circulation. Though inconvenient, change was now available. If you offered a gold dollar for a 5 cent or 10 cent article you were likely to get some very worn one and half reales and a handful of three-cent coins. These thin, little, insignificant looking coins, called “fish scales” by the public and joked about in the press, became the savior of American commerce. As time passed, however, the public became disenchanted with the little coins, as they were easily lost. In 1853, the silver problem was resolved by officially lowering the weight of silver coins to compensate for the rise in that metal’s price. The “Deficiency Act” of March 3, 1853 authorized the second version of the three-cent piece making it a .900 fine silver coin like the other subsidiary coinage. Longacre modified the star on the obverse with the addition of three outlines, and the reverse was changed to show a bunch of arrows below and an olive branch above the Roman numeral III. These changes were supposed to correct the striking problems that plagued the original design and to identify the change in weight and fineness. These first Type 2 pieces, dated 1854, were released on May 22. Changes in the design created additional problems, and the coin was even more difficult to produce than the earlier version. As a result, it is hard to find well-struck examples. The weakest area is usually toward the borders of the coin. This makes grading more difficult since the surface condition must be carefully considered to detect the difference between strike and wear. Due to improper die preparation, it is also common to see fine, parallel field striations on high grade specimens. Though not difficult to find in circulated grades, gem business strikes of this type are very rare, much rarer than gem Type 1 or 3 coins. Less than 5 million Type 2 three-cent pieces were made, and all were manufactured in Philadelphia. The rarest of the five dates is the low mintage 1855. Although some collectors assemble complete sets of the series, most of the demand for Type 2s, as with the earlier and later versions, comes from type collectors. The three different types are truly history lessons in miniature. Proof mintages are unknown, but probably less than 300 proofs survive today of the Type 2. In 1859, seeking a solution to the striking problems, Longacre again modified the design. 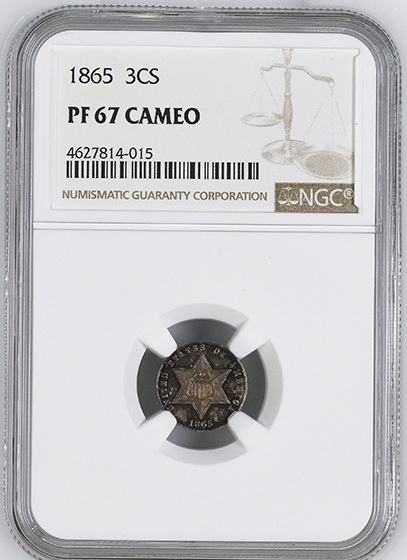 He removed one of the outlines to the star, and the resulting Type 3 coin was issued from 1859 through the end of the series in 1873. In 1859, little more than a decade after the start of the California Gold Rush, new gold and silver bonanzas again captured the attention of the nation. Vast deposits of the precious metals were discovered outside Denver, Colorado and in the famous Comstock Lode in Nevada. Much of this material wealth found its way to the mints in Philadelphia and San Francisco, where it was turned into coinage. Unfortunately, the growing distrust and divisiveness between the North and South would culminate two years later in the Civil War, leading to the demise of precious metal coins in commerce, and ultimately to the end of the silver three-cent piece as a circulating coin. Silver three-cent pieces (Type 1) were first introduced in 1851 to facilitate the purchase of three-cent stamps. The initial composition of 75% silver and 25% copper was designed to deter hoarding and melting of the coin as was occurring with the other 90% silver coins then in circulation. In 1853, Congress lowered the weights of all the silver coins, simultaneously raising the silver content of the three-cent piece to 90%, although at a reduced weight. Since the value of the silver in all the new coins was low enough to discourage hoarding, they circulated freely along with the new three-cent pieces, which appeared in 1854. These “Type 2” silver three-cent pieces featured the addition of three outlines to the star on the obverse and arrows and an olive branch on the reverse. The modifications made to the Type 2 coins exacerbated problems with striking up the design completely, and five years later more changes were made in hopes of bringing up all the design elements. In 1859, Chief Engraver James Longacre made minor adjustments to the coin. Assisted by Anthony C. Paquet, Longacre retained the basic design of the large six-pointed star on the obverse and the Roman numeral III in the center of the reverse surrounded by the letter C, but he reduced the number of outlines around the central star from three to two. In addition, he used narrower letters and spaced them farther apart than on the Type 2 coins, and he also reduced the size of the numerals in the date. These alterations were apparently enough to make the tiny silver pieces (derisively called “fish scales”) strike up better than their Type 1 or 2 counterparts. Unfortunately, after these changes were made and the Mint produced a better quality product, the coins only circulated for four years. The outbreak of the Civil War would again cause all silver coins to disappear. In the mid-1850s the Mint paid a price for bullion slightly above the current market price, a practice that effectively divided the seignorage (the profit the Mint derives from producing coinage) between the government and the bullion owner. This meant that the amount of silver coinage was not determined by the public’s need for change but by the amount of silver bullion sold to the Mint. As a result, there was a tremendous surplus of small copper, copper-nickel and silver coinage in the nation in the late 1850s—so much that small coinage was looked upon as a public nuisance. When the war broke out, this situation was radically altered. The federal government suspended specie (coin) payments for paper currency in 1862, and the glut of small change was quickly reduced to a trickle, as every coin with intrinsic value was either hoarded domestically or exported to Canada, the West Indies or Central America. The production of silver three-cent pieces during this period graphically illustrates the boom and bust cycle of U.S. coinage. From 1859 through 1862, the mintage of these small silver coins averaged 373,000 coins annually. For the eleven years afterward, annual mintages plummeted to an average of only 8,171 coins. All Type 3 silver three-cent pieces were struck at the Philadelphia Mint. Over the fifteen years represented by the design, 1,581,490 business strikes were produced. This is a misleading figure, however, as most of these coins were produced from 1859 through 1862. After 1862, virtually no silver three-cent pieces found their way into the channels of commerce, and both the business strikes and proofs remaining on hand at the Mint in 1873 were melted in the summer of that year. As a result, business strikes from 1863 to 1873 are great rarities. Consequently, few collectors are willing to attempt completion of a set of business strikes of the Type 3 design, and today silver three-cent pieces are almost exclusively used as type coins. Oddly enough, some high grade business strikes known from this period actually came from proof sets. Apparently, in the 1860s and `70s, the Mint was not careful about the distinction between the two methods of manufacture, and if a proof was not available for sets a business strike was substituted. Proofs were made in each year of the Type 3 series and the scarcest date is the proof-only issue of 1873, of which only 600 pieces were struck. At least two business strike overdates exist: the relatively common 1862/1 and the very rare 1869/8. 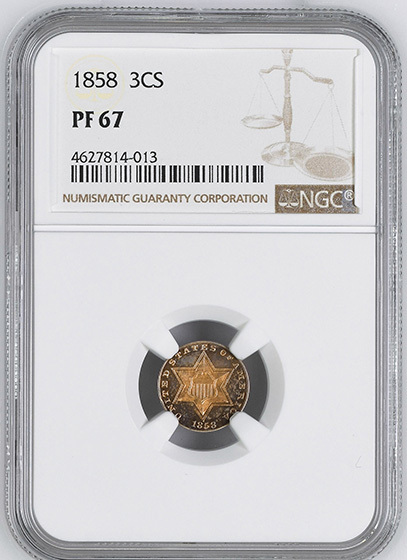 An overdated proof is known—the 1863/2—a rarely encountered coin that is technically a restrike and apparently produced in 1864, along with some restrike proofs bearing that date. When grading silver three-cent pieces, it is often necessary to use a magnifier because of the small size of the coin. Wear first shows on the top ridges of the star on the obverse and on the Roman numeral on the reverse. Counterfeits were made in large numbers during the Civil War, but the date and lettering differ from authentic pieces, and these pieces were not struck in silver but in some form of so-called German silver (a nickel alloy). Dangerous forgeries surfaced in 1984 of the 1864-dated restrike. 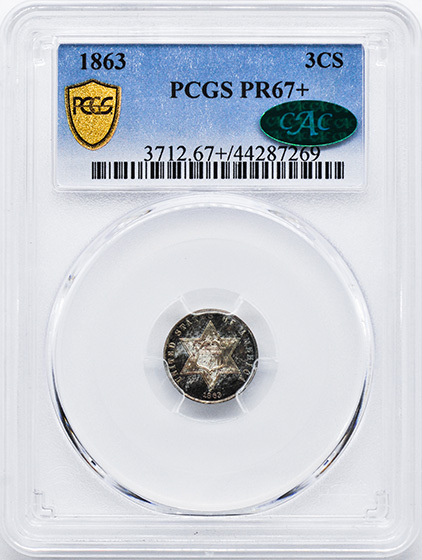 These pieces allegedly originated in England and differ from genuine coins, as the digits of the date are thinner and placed higher in the field and all show a dent on the lower left corner of the obverse star. When silver three-cent pieces were abolished by the Mint Act of 1873 few people noticed. The coins had not been seen in circulation since the early days of the Civil War, and they had become redundant to the nation’s coinage needs when the nickel three-cent coin was successfully introduced in 1865. Today, only numismatists remember these tiny coins and the important part they played in the nation’s coinage system in the 1850s and the early days of the Civil War.